Robert Hind and Hannah Peirce Low were married in Honolulu, April 26, 1892. In 1893 he entered into a partnership with his brother-in-law, Eben P. Low, in the cattle ranch on the Island of Hawaii, now known as Puuwaawaa. In 1903 Mr. Hind purchased Mr. Low’s interest in the ranch and took over full management of the property, resigning his position with the Hawi Mill and Plantation Co., Ltd. which he had held continuously since 1885. Mr. Hind now has more than two thousand head of cattle on the Puuwaawaa ranch. In 1946, the ‘Āina Haina dairy operation was sold to Creameries of America, and soon after that began to develop the remainder of his land for residential use. Central to Hawaiʻi’s use of water has been agriculture, sugar in particular. Initially brought to the islands by early Polynesians, the first successful commercial sugar plantation started in 1835. And, with it, Hawai`i’s environmental, social and economic fabric changed. Hawaiʻi’s economy turned toward sugar in the decades between 1860 and 1880; these twenty years were pivotal in building the plantation system. What encouraged the development of plantation centers? For one, the American settlement of California opened lucrative avenues of trade in the Pacific. In addition, the Civil War virtually shut down Louisiana sugar production during the 1860s, enabling Hawai’i to compete in a California market that paid elevated prices for sugar. The Pacific whaling trade collapsed after 1860, pushing Honolulu merchants into the sugar trade. About the same time, the closing of the Hawaiian mission left the previously supported missionaries in search of new means of income. The 1876 Treaty of Reciprocity between the United States and the Kingdom of Hawaiʻi eliminated the major trade barrier to Hawai`i’s closest and major market. Through the treaty, the US received a station at Pearl Harbor and Hawaiʻi’s sugar planters received duty-free entry into US markets for their sugar. For nearly a century, agriculture was the Island’s leading economic activity. It provided Hawai`i’s major sources of employment, tax revenues, and new capital through exports of raw sugar and other farm products. Sugarcane requires a lot of water to grow. 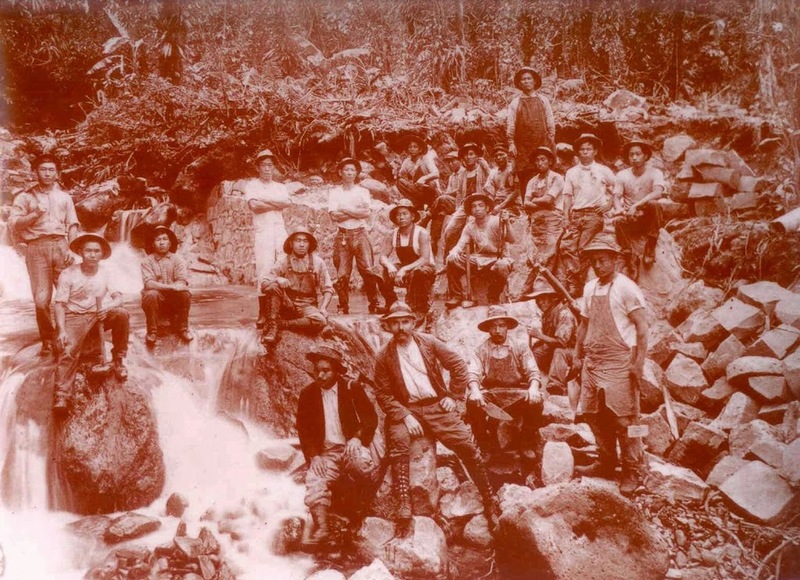 Pioneer sugar planters solved water shortages by diverting stream water and building irrigation systems that included aqueducts (the first in 1856), artesian wells (the first in 1879), and tunnels and mountain wells (the first in 1898). These irrigation systems enabled the planters to expand their sugar production. These irrigation systems were modeled largely after the elaborate and extensive diversion and ditches developed by the ancient Hawaiians. Unlike the traditional Hawaiian system, which never diverted more than 50% of stream flow, the sugar plantations diverted large quantities of water from perennial streams and moved water from one ahupuaʻa to another. Boston missionary Reverend Elias Bond sailed with the Ninth Company of Protestant Missionaries, arriving in the Islands in 1841. He was then assigned to Kohala. As a means to provide employment to the people in the region and support his church and schools, in 1862, Reverend Bond founded Kohala Sugar Company, known as “The Missionary Plantation;” it produced its first sugar crop in 1865. Bond gave all his dividends and profits beyond his living expenses to the Board of Missions. From the mid-1800s, the sugar industry developed and commercial centers sprung up around the processing mills, especially in Kapaʻau and Hawi. The construction of the railroad and the Kohala Ditch acted to encourage the further development of these more centrally-located communities. To water the crop, John Hind first conceived of an irrigation system tapping into the abundant, wild and inaccessible rivers that ribbon the Kohala Mountains. In 1904, JS Low acquired a license from the Territory of Hawaiʻi to “enter upon, confine, conserve, collect, impound and divert all the running natural surface waters on the Kohala-Hāmākua Watershed;” he assigned the license to the Kohala Ditch Company. The Kohala Ditch, built by the Kohala Sugar Company, diverted water from the Honokāne Nui Stream to Hikapoloa, west of Hawi. 600-Japanese laborers worked on its construction; in the process, 17 lost their lives. The Honokāne section of Kohala Ditch was opened on June 11, 1906; waters of Honokāne began flowing to the Kohala, Niuliʻi, Halawa, Hawi and Union mills. The Awini section was finished in 1907; it started from the Waikoloa stream and traveled over 8-miles, mostly in tunnel, to the Awini weir where the water dropped 900-feet in a manmade waterfall into the Honokāne section. The ditch carried the water for 23-miles northwest, mostly as tunnel, toward Hawi. The capacity was originally 70-mgd, later reduced to 50-mgd, when the original flumes were replaced with smaller ones. The ditch drops about 80-feet in elevation from 1,045-feet at the bottom of the intake at the first large stream (Honokāne) to 956-feet at the terminus in the plantation fields. Prosperity came to Kohala. At the peak of its production, the Sugar Company had 600-employees; 13,000-acres of land produced 45,000-tons of raw sugar a year. As with other sugar operations, it didn’t last. 1975 saw the last harvest at Kohala Sugar Company. The district’s economy struggled. Almost one-third of the workforce now commutes to South Kohala to work in the hotels and resorts located there. However, the Ditch remained open for other agricultural needs. Vulnerability and the risks associated with reliance on the Kohala Ditch were made evident on October 15, 2006, when two earthquakes struck off Kiholo and caused extensive damage to the Kohala Ditch. In that instant, rockslides and other damage to the ditch stopped the water from flowing through the Ditch. Two years later, on November 25, 2008, after extensive community involvement and public/private funding ($2-million in federal money, $500,000 from the state, $500,000 from Hawai`i County, $342,000 from Kamehameha Schools and $100,000 from AT&T), water was released back into the Kohala Ditch after repairs to the damage caused by the 2006 quakes. Agricultural and hydroelectric users continue to benefit from the Ditch; in addition, entrepreneurs saw an opportunity for recreational/visitor industry uses of the ditch with kayak and raft rides through the flumes and tunnels of the Kohala Ditch. The image shows workers in the construction of the Kohala Ditch. In addition, I have added other related images in a folder of like name in the Photos section on my Facebook and Google+ pages. Waikīkī (“water spurting from many sources”) ahupuaʻa lies between Honolulu (from the west side of Makiki Valley) and Maunalua (the east side of Wailupe) – essentially from Piʻikoi Street to the ʻĀina Haina/Niu Valley boundary. It included several ʻili, subdivisions/portions of ahupuaʻa. Wailupe is one of these ʻili; it is actually an ʻili lele (jumping ʻili) that includes the area we now call ʻĀina Haina and kalo (taro loʻi) lands in nearby Pālolo Valley. From ancient times, we learn Wailupe is part of the tradition of Kamapuaʻa, a multi-formed deity. ʻOlopana, an Oʻahu Chief (and younger brother of Kahiki’ula,) was an adversary of Kamapuaʻa. After several skirmishes and confrontations between them, Kamapuaʻa finally killed ʻOlopana and conquered Oʻahu. In Hawai‘i and essentially in all cultures – water meant life and growth. In Hawai‘i – “Wai” – fresh water – is a life force – it meant abundance and wealth and was a consistent theme in native traditions, practices, land use and historical accounts. There are three gulches forming the valley; the main Wailupe Gulch follows the lower Wailupe Stream and a branch to the northwest. The northeast branch follows Laulaupoe Gulch, which is named for a round (poe) type of leaf package (laulau) used for food and for presentations. The land of Wailupe was reportedly distributed to the father of Kamaha by Kamehameha the Great following the Battle of Nuʻuanu in 1795. In Wailupe, 57 claims were made and 37 were awarded, indicating that there was substantial settlement in the area. The claims were mainly for kula lands with sweet potato, coconut, orange, hala, ipu and pili grass with no mention of taro being grown. Lots averaged 1.5-acres with two kula patches. The majority of lots were adjacent to major streams within the valley. Soon after this the Hawaiian Dredging Company filled in the old Wailupe Fishpond, forming the Wailupe Circle subdivision. A deep channel (depth of approximately 12 to 20 feet) was dredged around the pond, as well as a channel through the reef to the open ocean) and dredge material filled in the pond. 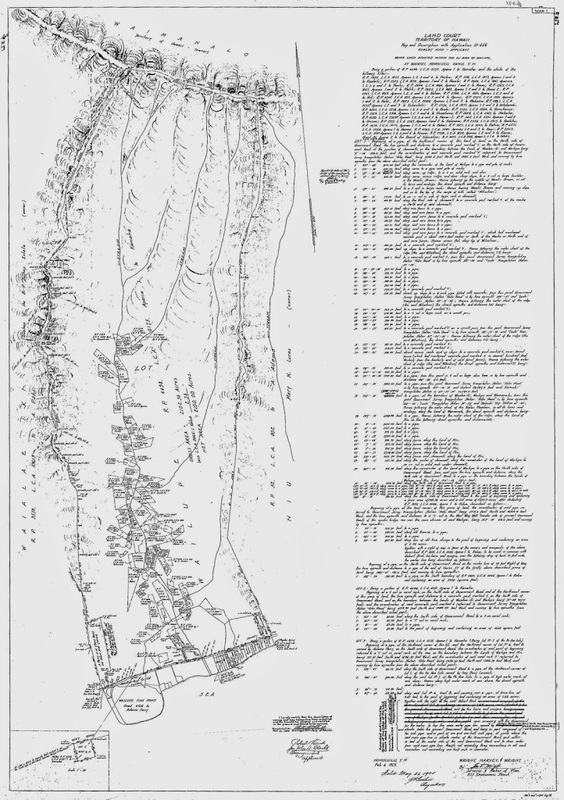 The image shows a 1925 map if the ʻili of Wailupe (note the LCA properties along the stream.) In addition, I have added other related images in a folder of like name in the Photos section on my Facebook and Google+ pages.